This is a special one time run of this special one of a kind car. 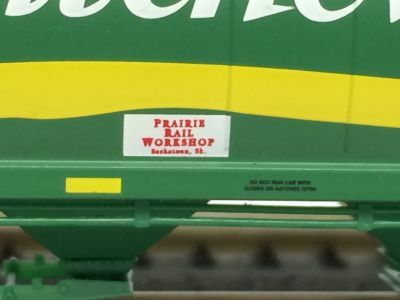 This car was developed at the request of the Prairie Rail Workshop Model Club. It is based on the 2011 Saskatchewan Grain Car Corporation CN assigned paint scheme. The car was modified by members, as shown in the photograph below. While Prairie Rail Workshop members are purchasing this car directly through their club. We are making it available to our customers as a special collector's edition car. All profits from this project are designated for the benefit of the Prairie Rail Workshop.